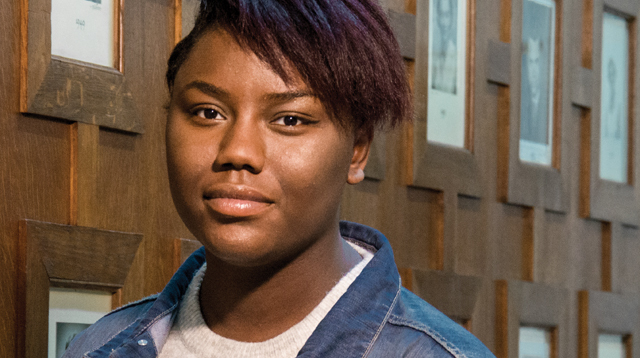 Tasheeka Wilson came to Woodhouse from Ark Elvin Academy and lives in Wilsden. She studied history, philosophy and psychology at A level and graduated in 2018 with AAA. She is currently at SOAS studying Law. “On a good day, I have a forty-five minute journey to Woodhouse, and on a bad one – an hour and a half. I knew that before I came, but I really, really wanted to come. My favorite teacher in year nine was an ex-Woodhouse pupil and she told me what a great college it is and when I visited on open day I thought it was amazing, so different from my secondary school and I knew ‘Yes, this is where I want be’. In GSCE history at my school, they told me what you need to write, and how to write it, and gave me all the resources. So, at A level it was kind of a shock to me how much reading I would have to do that is outside of the text books. The essays we write aren’t as formulaic, and we don’t have a set structure in which we have to write, which at first I found difficult. Now, the emphasis is on writing a good essay that flows well. You need to show that you are actually thinking about the question.You need to voice your opinion at A level, but you also need to know the facts – and know them well. We have a lot class discussions and there aren’t really any rights or wrongs, it’s quite open ended. I’m enjoying studying the Russian revolution, it has got so much happening in such as short span of time, with the rise and fall of communism. It’s really interesting to look in to why that happened and the impact on it’s had on Russia now. I’d actually read George Orwells’ ‘Animal Farm’ before years ago, but it hadn’t clicked with me then that it was about the Russian revolution. Now we are studying it, that book makes much more sense to me. We went to a conference as part of our course where we got to speak to the people who had written our text books and they spoke to us about specific parts that we wanted to clarify. It was really helpful. We have another visit this year about the Russian revolution coursework we are doing. I went on the Berlin trip and really recommend it. Being able to just be there and see what’s left of the wall... amazing.We spent three nights in middle of Berlin and the accommodation was really good. We had lots of structured activities like visiting the Reichstag, touring around old East Berlin and taking a canal trip, but we also got plenty of free time in the evenings to explore the city centre. I’m planning to study Law at university. I’ve done some work experience with both barristers and solicitors and haven’t yet mad up my mind up on a career path, it’s just that law interests me. I definitely want to apply to UCL, but I’m also looking at Warwick, SOAS, Kent, Manchester and Birmingham as possibilities. I didn’t think I wanted to stay at home, I wanted to move away, but then I went to a UCL summer school and it was very good, so we’ll see. There’s pretty much a society for everything and lots of extracurricular here. I‘ve been part of FEMSOC (feminist society) and Spectrum (LGBTQ society), which was really interesting and I will be a part of our Afro-Caribbean society this year.I also took part in the debating society. At first I wasn’t very good at public speaking but I chose it knowing that. I was very shy, but practice helped and it was a good challenge for myself. I’ve also managed to get back into playing netball, and did some MMA here last year, which was fun. Everyone’s really friendly here – I’ve never met a person that I couldn’t talk to or ask a question of. Also, the work ethic… Everyone has come here because they want to work. You never really have that person that’s not working and is distracting people, everyone is working. There’s always a place you can work, quietly or in groups, but there’s also the social area where you can go and not feel pressured to work and you can just sit and have a conversation with someone. I’m much more likely to try new things now. I was quite closed off when I first came here but Woodhouse makes you more open to things. I’ve never met anyone who has judged me for doing or saying anything here, and that makes me feel that I should at least offer other students the same courtesy if I don’t agree with them. Before, my school was very religious and the political opinion very narrow, but coming to Woodhouse… I may not agree with someone’s opinion about politics or whatever, but I can at least listen to them, and might even realise that I agree with something that they have said. Everyone here is so different, and you are likely to meet someone you have never spoken to before on most days, but you can have an intelligent conversation with pretty much anyone about anything. I’ve got friends from everywhere. Lots of people travel from far to get here, and a few of my friends don’t live anywhere near me. One commutes two hours on the train every day, but that just shows how good Woodhouse is because she still wants to come, just like me."